After a break of some thirty years, The Incredible String Band's Clive Palmer is back in the studio with fellow Jug Band members Pete Berryman, Jill Johnson-Sharp and Henry Bartlett. 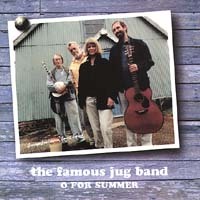 This is the third album from The Famous Jug Band (much championed by Ralph McTell with whom its members worked) and is again produced by the legendary Pierre Tubbs. Recorded in a village hall in Dorset, England this album of brand new songs is yet another charming venture in English pastorality. Featuring Jill Sharp's clear, pure voice over the accompaniment of Pete's accomplished guitar playing, Clive's banjo and the distinctive trademark jug-playing of Bartlett (critically regarded as the country's leading exponent of the art). high quality folk music with some interesting sounds"